September’s bounty at the farmer’s market…. We’re are having what’s known a ‘mast’ autumn this year when the abundance of nuts and berries means that animals are able to build up their hoards for the winter. And that’s a great opportunity for me to do the same and head off to the market ready for action on bottling, preserving and baking front. My timing is always a little off as now my children are out of education I always go away this month just as the apple and quince tree in my garden are about to deliver all their bounty in one go. But the September market is always one of my favourites as it heralds the change of season and lots of lovely opportunities to cook. At Penshurst tomorrow Paul at Arcade Fisheries has plenty of Dover soles and his amazing mackerel. I’ll be buying one or the other – the sole cooked simply with lemon and butter and mackerel filleted and baked in a very hot oven on a bed of sliced potatoes, onions and peppers with white wine poured over. The resulting fish – crisp but still full of flavour and texture with the crispy soft centred potatoes is fit for the gods! Plums for my favourite plum and almond cake will also find their way into my basket – see my Busy Mum’s Cookbook for the recipe version with blackberries and apples (another family favourite at this time of year). I may even swap the almonds for cobnuts – roughly ground, they make a delightful change to the final cake. 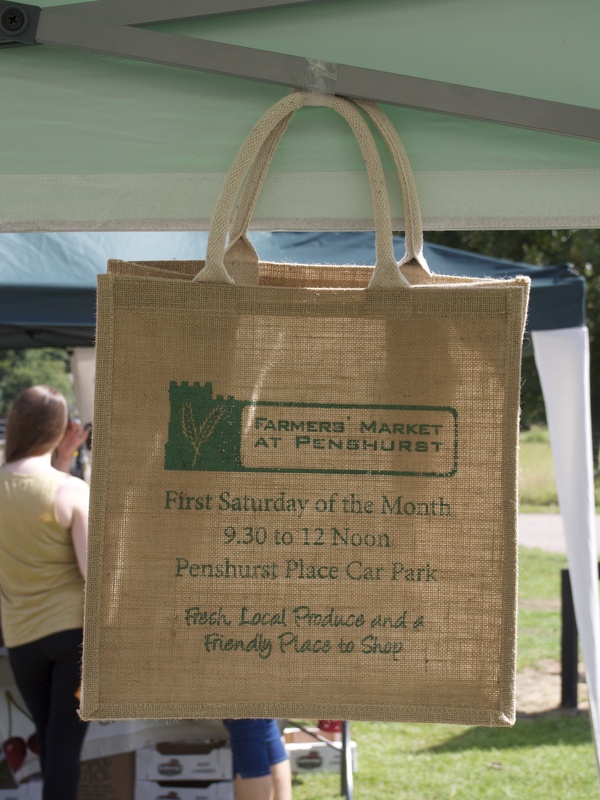 After the welcome warmth of the summer providing a welcome reprieve for farmers and growers after the challenging conditions of the last couple of years, if there’s a time not to miss a visit to your local Farmer’s Market then this must be the month. All the promise of the summer’s long growing season is now delivering, though the weather may still provide us with plenty to talk about as we might get a lovely Indian summer or an abrupt entry into the winds and chills of autumn. It’s the time to enjoy an abundance of game, wonderful seafood, and here in the Garden of England all the finest apples and dessert pears for which this area is justly famous. It should be a great season after the cold winter and warm summer so make sure you try as many local varieties as possible. You can still find the end of the summer berries but also the richer hued autumn fruit, such as plums and gages. 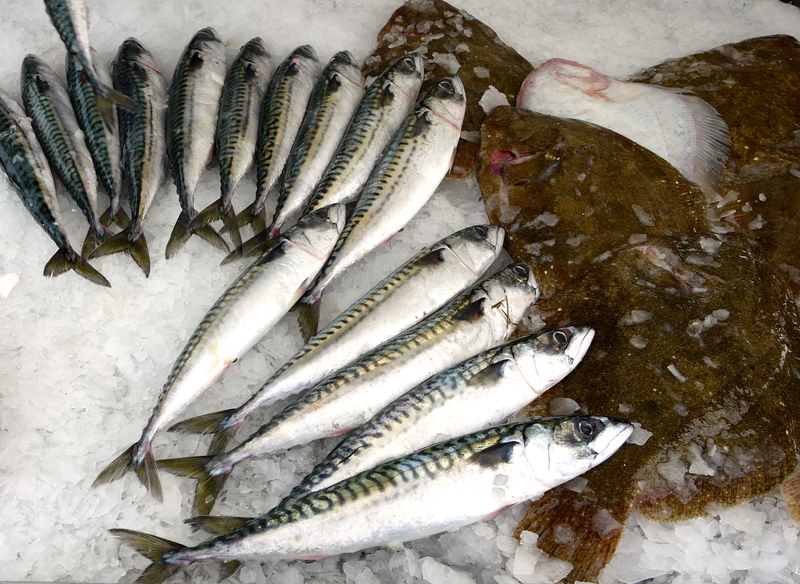 Fish and seafood are plentiful this month and very reasonably priced. For seafood lovers look out for crab, mussels and prawns – and with an r in the month, it’s the start of the native oyster season too. If you’ve never cooked squid this is the time to give it a go – slice into rings and stir fry with a little chilli and soy sauce, or stuff and cook in a garlicky tomato sauce. (for a recipe and step by step guide to preparing squid see my blog entry called ‘squiddly diddly‘ from July). The changing season and the return to school also herald a longing for richer more comforting meat dishes so make a vow to try game this year, particularly venison. It’s the perfect locally sourced free-range meat – minimum food miles, low in cholesterol and full of useful vitamins. You can find farmed and wild – and modern game is no longer the tough, strong meat that needs long cooking. Lean and tender, it suits short cooking methods such as frying and grilling. Look for recipes on the internet as plenty of chefs are now using British game on a regular basis. If watching budgets remember that cheaper cuts of meat such as belly pork, shin of beef and lamb shank all taste particularly good and tend to be easier to find at the market where meat producers use their skills to ensure the entire animal is prepared for home cooks to enjoy at its best with no waste. For lighter meat, try guinea fowl, which should be free-range. Cook in the same way as a small chicken, maybe roast wrapped in streaky bacon, and enjoy the flavour, which is richer than chicken and subtly gamey. With tomatoes, courgettes, sweetcorn, peas, cauliflowers, runner beans and onions all plentiful and cheap right now this might be the month to try making your own chutneys and pickles. You don’t have to make huge amounts – just a jar or two can be very satisfying and you might just get the bug. Winter squashes and pumpkins are starting to arrive and come in an amazing array of shapes and sizes all with different flavours and textures – try in soups, curries, gratins and risottos. If the weather turns wet look out for the appearance of wild mushrooms, and also search out local cobnuts and walnuts. Tree fruit are at their best and juiciest so don’t miss plums, damsons and greengages. They are wonderful for eating (not damsons! ), and using in preserves, ice creams, pies, and, if feeling very adventurous, even your own liqueurs and wines. (For recipes the Women’s Institute books are very reliable.) The blackberry season is also at its height and you can find both cultivated and wild berries for crumbles, jellies and jams. To make the pastry sift the flour into a large mixing bowl and rub in the butter until the mixture looks like fine breadcrumbs. Stir in the sugar. Whisk the egg yolk with 3 tablespoons chilled water and stir in to the dry ingredients. Mix quickly to a firm dough. Wrap in cling film and chill for 15 minutes. Preheat oven to 190C gas mark 5. Roll out the pastry on a lightly floured work surface and use to line a 23cm loose-bottomed deep flan tin. Chill while you prepare the filling. Quickly grind the hazelnuts in a blender or food processor but don’t over process. Cream the butter with the caster sugar until pale and light. Beat in the eggs one at a time then fold in the ground hazelnuts and the sifted flour. Spoon into the pastry case and spread level. Peel, core and slice one and a half of the apples then core and slice the other apple and a half. Arrange over the cobnut frangipan and press lightly into position. Place the tart on a baking sheet and bake for 45 – 50 minutes until the pastry is golden and the filling cooked through. You can brush the top with warmed apricot jam for a glossy finish. Cook’s tip: this tart freezes well and can also be made with pears, halved plums or peaches! 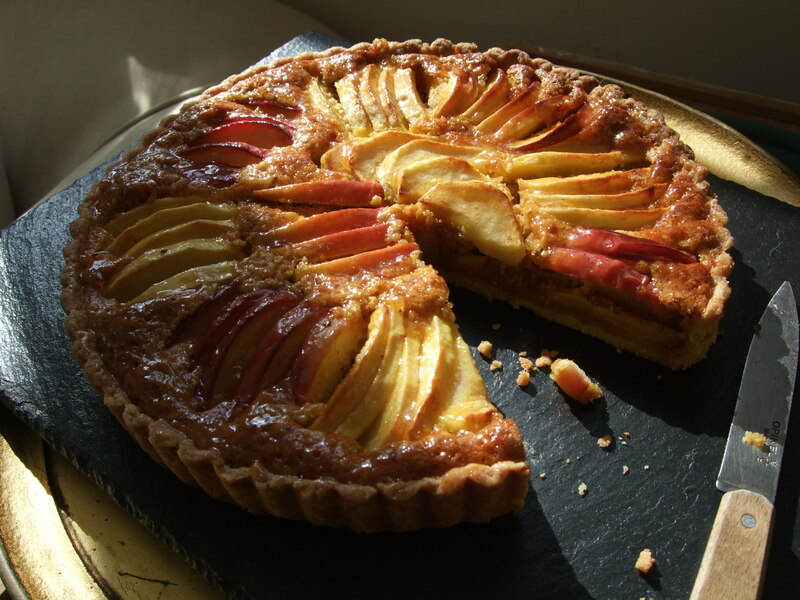 This entry was posted in Farmers Market, In season, Recipes and tagged apple tart, cobnuts, farmers market, in season, Kent, Kent farmers markets, mackerel, nuts and berries, Penshurst farmers market, penshurst place, recipes. Bookmark the permalink. 2 Responses to September’s bounty at the farmer’s market…. Please reblog this lovely piece on to Saffron – it’s perfect for now – if I do it appears under my name which is quite wrong! Reblogged this on Saffron Magazine.